Mackenzie Report Inc. group of community weekly newspapers has always been an independently owned and operated organization. The original company was founded by Mike & Ethel Mihaly in High Level in 1973 when The Echo newspaper was established. The business also included a commercial print shop and stationery store. The Mihaly’s went on to add The Northern Pioneer and Mile Zero News as new publications in the mid and late 1970s. The Banner Post was also added in the 1970s when it was purchased from its founders Gerry Howis & Del Harbourne. 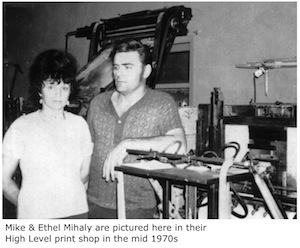 Although the commercial print shop and stationery store has long since closed, the newspapers remain in the Mihaly family and are now owned by Tom & Lorna Mihaly. In April 2015 The Echo and The Northern Pioneer publications merged to become one regional newspaper serving High Level and Mackenzie County.